If you read a lot of blogs, especially ones from Europe, you've probably heard of Kiko cosmetics. I've always heard great things about the brand, but was intimidated by their extensive lists of products. They have seventeen different lipstick formulas available at the moment! My early wish-lists were getting really up there in price, so eventually I decided to only pick up three items as a first try. Kiko is somewhere between a drugstore and mid-range brand; some of their products are as little as $3 while others are in the $15 range. A lot of their products are dupes or are comparable to higher-end brands, so even the more expensive products can still be a good deal. I've heard the best things about their eyeshadows and lipsticks, so that's what I decided to pick up. Shortly before I went cruelty-free, MAC launched their magnetic shadows. They looked so gorgeous and I put about five on my wish-list, and was very sad to know that I wouldn't be able to try them. Cue these dupes, which are $10 cheaper and include a lot more neutral shades. I got this gorgeous taupe color. The consistency surprised me so much. I dipped my finger in it, expecting it to be somewhat hard like a pressed shadow, but it's just loose pigment that keeps it's shape because of the magnet. I remember in Tati's review of the MAC shadows they swatched better with a brush than a finger, so I tried both below with the small brush included in the Urban Decay Naked palette. Something about the magnetic pigments in here makes the shadow bunch together when used with a brush. It reminds me of those little flakes in an Etch a Sketch! This is a really cool eyeshadow and I think I'll use it a lot. This is the Kiko product that I've heard the most about. They are supposed to be a good dupe for the By Terry Ombre Blackstars, Laura Mercier Caviar sticks, and other high-end cream stick shadows. These are great for a quick eyeshadow application. It's easy to blend and this color is a beautiful cool-toned bronze. I definitely will add more to my car the next time I make a Kiko order! The packaging of this lipstick is what I was drawn to, along with the velvet finish which I still enjoy in a lipstick. The square shape reminds me a lot of the Charlotte Tilbury lipsticks, but the formula is much lighter and less pigmented. I swatched Vintage Rose below next to Pillowtalk and they aren't super similar, but it's a good comparison. I will say that if you build this lipstick up to full opacity on the lips, it is going to stay for a long time. I blotted the lipstick with a tissue and after the third blot it still looked good on the lips, but I wasn't getting a lot of transfer on the tissue. If you like long-lasting, affordable lipsticks this might be a good one to check out! The packaging is also nice, heavy, and metallic which is always a plus for me. Next up on my Kiko wishlist are more of their lipsticks, blushes, and their water eyeshadows which are very popular. Let me know if you have any more recommendations and what you think of my picks! 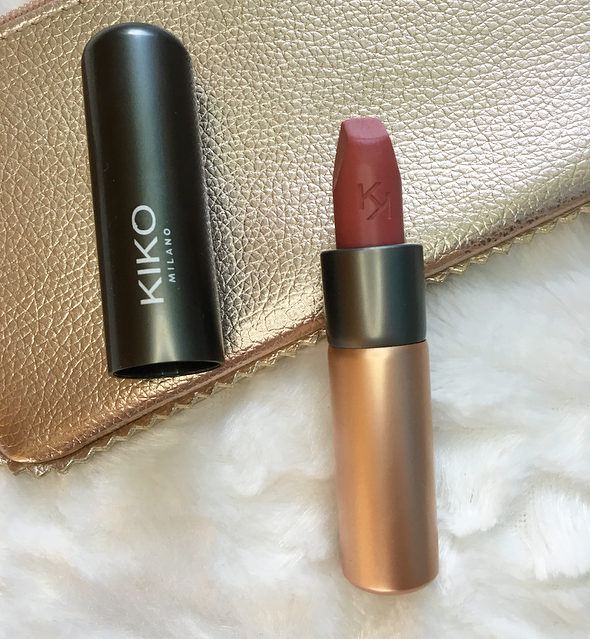 18 comments on "First Impressions of Kiko Milano Cosmetics"
When I first discovered their store I fell in love with the Eyeshadows! I have s review of one of their quads on my blog. They have very nice and cheap polishes too. Im curious to try other things from them soon! I always hear about how great Kiko's products are, but I've never tried anything from them before. These swatches look fab! I love their Velvet Matte lipsticks! I actually like them better than the Charlotte Tilbury ones! I have heard a ton about this brand and really want to try some of their products. The lipsticks look stunning. I've seen this brand a couple of times and was always hesitant. 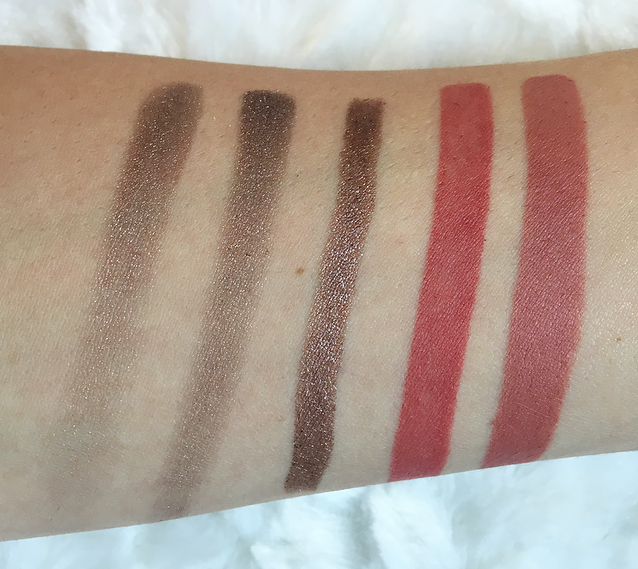 I actually really like the swatches especially the vintage rose! There is a kiko store in the next town over which every so often I will go too. 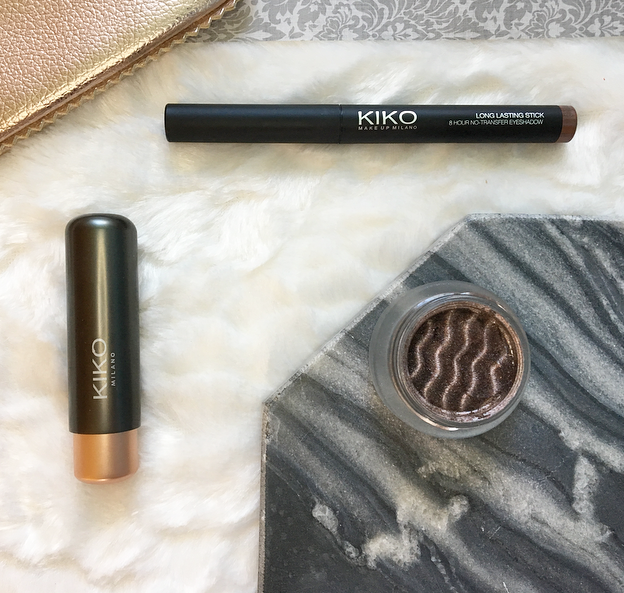 I first found a kiko store when I was holidaying in Portugal and just love the make up brand and a lot of the make up is some of the best make up I have tried. I love the shadow sticks they remind me of the charlotte tilbury eyes to mesmerise except much cheaper. I love the lipsticks I have not tried the matte lipsticks though this lipstick on your blog post looks stunning and the next time I make an order I will have to give it a try. I see what you mean about the lipstick having a charlotte-esqe tilbury look about about it . The eye wet look eye shadows are really good and the blushers are too. I am using this one for a long time. After doing my make up lesson by expert , I bought a lot of lipsticks. This is one of my favorite from there.